Sorry about the back-to-back posts, but I always get excited when more than one daily t shirt site has awesome shirts available simultaneously. Qwertee is a U.K. based site, so “KRRAAAANNGS” by Harebrained! actually wasn’t available until 6 p.m. EST. today, and will be on sale until that time tomorrow (08/18). 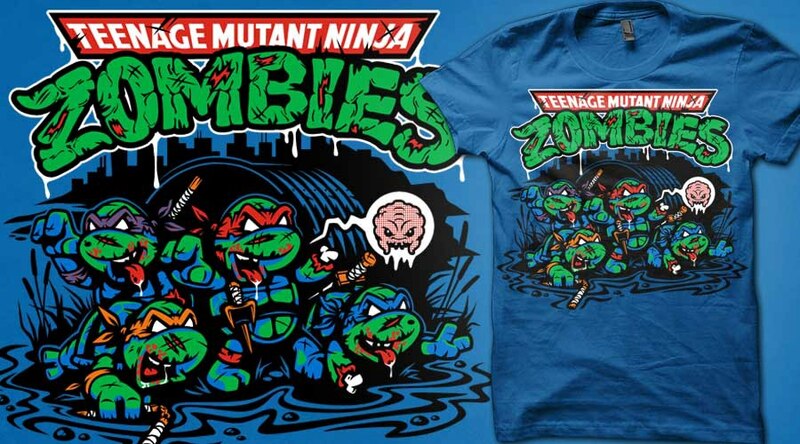 The design works really well on blue, with the shirt color acting as the shading on the green skin of the Turtles. Harebrained! also worked the halftones to ensure that everyone had their bandana colors from the cartoon (unlike the all red of the original comic book). Harebrained! is the man behind the “Bat Country” t shirt I featured last month. For extra credit, stop by his shops at Storenvy and RedBubble. 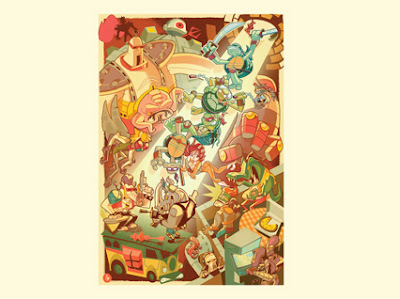 A perfect addition to my office, Split Reason‘s “Turtles” print features all the great TMNT characters. Split Reason offers a bunch of other cool Glen Brogan prints as well. I might have to add this sticker to my purchase.